The tight journalism job market is taking its toll on recent college graduates, according to a new report released today by the University of Georgia. The survey of more than 2,700 journalism and mass communication students who graduated in 2009 found the lowest level of full-time employment in the 24-year history of the study. 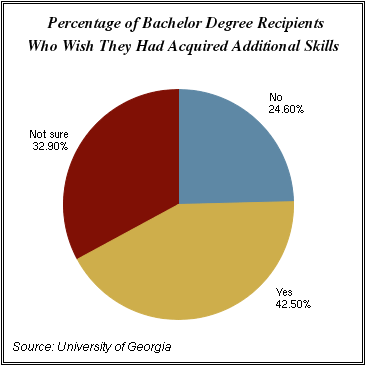 The results, included in the University of Georgia’s “Annual Survey of Journalism and Mass Communication Graduates” reveal that just 55.5% of 2009 journalism and communication graduates with a bachelor degree were able to find full-time work within a year of leaving school. That is down 4.9 percentage points from the year before and stands in stark contrast with the 70.2% of graduates who found work as recently as 2007. The most recent masters degree recipients fared little better, with their employment rate dropping to 61.9% from 65.4% in 2008. Although 2008 was a difficult year for new graduates seeking employment, the 2009 jobs picture was markedly grimmer. “While 2008 was bad, last year was even worse,” said Lee Becker, the report’s co-author and the director of the Cox Center for International Mass Communication Training and Research at the University of Georgia. Becker did offer one silver lining, noting that students found it easier to get jobs in the period from November 2009 through the spring of 2010 than they did in the first few months after graduation. “In 2009, there was a clear growth line after October 31, which didn’t happen the year before,” said Becker. This daunting job market was further compounded by stagnating salaries and eroding benefits, according to the survey. 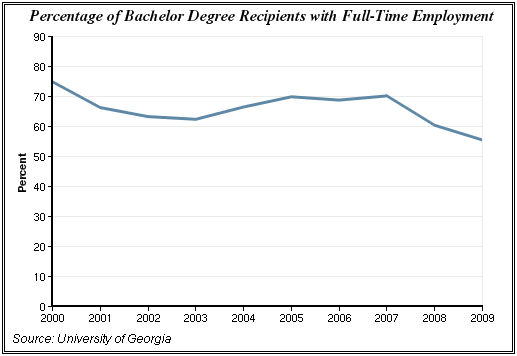 The median annual wage for full-time employed 2009 bachelor degree recipients again stood at $30,000, the same number it has been since 2006, although inflation edged up in the past year. At the same time, benefits continued to be cut across the board, with only 52.9% of the 2009 employed grads receiving major medical coverage at work compared with 59.2% the previous year. Dental coverage fell from 56.7% to 50.3%, and life insurance benefits dropped from 49.1% to 41.7%. Another troubling aspect of the market downturn identified in the survey was its disproportionate impact on ethnic and racial minorities. 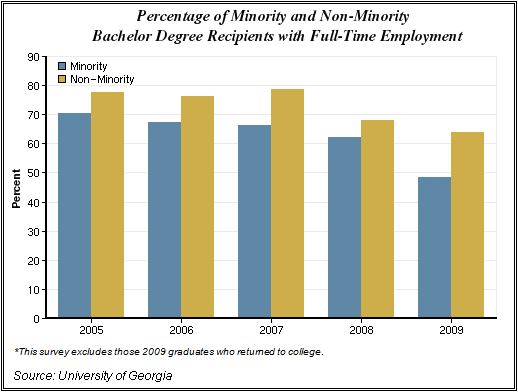 When the survey excluded those students who opted to return to school rather than enter the job market, fewer than half of the 2009 minority graduates with undergrad degrees (48.6%) found full-time jobs compared with 63.9% of non-minority graduates. That gap of 15.3% almost tripled from the previous year, when it stood at 5.9% and represents the biggest such difference in the more than two decades that the University of Georgia has been monitoring this. “Unfortunately, minority graduates are still not playing on a level field, and when the market gets bad, it gets worse for those on the margins,” Becker said. Yet for all the troubling news, the study’s authors did identify a few encouraging signs, such as an increase in the number of 2009 graduates working with the internet, a central component of modern journalism. Fully 58.2% of the recent bachelor graduates with communication jobs reported being involved with Web writing and editing, a substantial increase from 50.6%, the year before. When it came to the students’ assessments of their college educations, the results were mixed. A majority of graduates (58.3%) said they were satisfied with the way school had prepared them for communication jobs. But 41.7% said they either hadn’t been properly prepared or weren’t sure. In addition, 42.5% said they felt that they hadn’t acquired certain key skills necessary for real-world success — mainly in new digital technologies and job seeking strategies. While Becker attributes some of that dissatisfaction to a general frustration with the poor jobs market, he admits that academia could be doing more to prepare graduates for jobs in the real economy. “We know that J-schools are struggling to create a curriculum to match market needs,” he said. On the broader question of whether they had made the right degree choice, nearly two-thirds of the 2009 graduates (64.4%) said they did not regret their communication career choice despite the challenges. Conversely, 31.8% said they regretted their decision. As recently as 2005, 70.9% of the grads say they had made the right career choice as opposed to only 24.6% who had second thoughts. You can also find links to journalism jobs, journalism schools and other journalism resources — as well as a note of advice to students about a career in journalism — at journalism.org.